In the fall semester I thrive. In the spring semester I survive. By the middle of the spring semester, fatigue has set in and doesn't go away until final grades are submitted. I live in New York State. So in fall there are piles of leaves, in winter piles of snow, in spring piles of papers. By the end of the fall semester, my plate is full. By the middle of the spring semester, all my plates are full. In the fall semester I can quickly respond to e-mails, in the spring semester days go by before I respond to some. In the fall semester I separate tasks into two categories: front burner and back burner. This is a way of prioritizing my to-do list. In spring I don’t know the difference between front burner and back burner. I’m behind on grading, tired of class preparation, and busy providing academic advisement to students for next semester. By April, scholarship is an afterthought. And I do what I must. Some things can’t be put on hold. Obviously we have to grade papers, write final exams, and compute final grades. There are certain tasks that have to be accomplished. So I put my focus where it has to be. This time of year it’s hard to be all things to all people. So I do what I can, and do what I must. And I try to do it well. There’s a saying out there somewhere “Do what you love, love what you do.” That’s nice, and so are Hallmark cards and cute notes I leave in my wife’s lunch bag once in a while. But at the end of the academic year, I need practical, realistic advice to get me through. And that’s why “do what you can, do what you must” works for me. Summer is on the horizon. Summer brings rest and revitalization. Yes, there’s work to be done during the summer, but the pace is much friendlier and far less taxing. In summer I can once again distinguish between front and back burner, and I’m back to one plate that isn’t full. At the beginning of the academic year, patience comes easy. Come winter, patience is a virtue. By April, patience is a miracle. Patience, energy and motivation are hard to find at the end of the academic year. So I do what I can and do what I must in the best way possible to make it to the finish line. Todd Schoepflin: So, Matt, where are you at right now with Twitter? What excites you about Twitter? What frustrates you? Matt Loveland: The most exciting thing about Twitter is that I see it connecting me with a community of scholars/journalists/activists that I wasn't even aware of until very recently, but I feel a part of. I think that I have something to contribute to what is happening there, and I find that very often I'm coming across ideas/resources that are helpful in my professional work. Also, I'm finding that it is actually rewarding work in and of itself. I see it as a place to be a public scholar, and this is particularly the case when it's connected to my blogging and the blogging of others. I'm working on getting others here at Le Moyne to see it this way, and really that's just part of a bigger movement in the academy to rethink the substance of academic work. There are, of course, a number of frustrations. One is that some people really do seem to carry typical academic prejudices/pretensions onto Twitter. My opinion is that this is more common among the big names I find on Twitter, and so in this way it can look just like the academic hierarchies that we see in publishing, at conferences, etc. That's a shame because it seems to obliterate one of the potentially fantastic things about Twitter, that we can meet and learn from a wider range of people than if we are stuck in our brick and mortar schools. Someone, for example, with 3000 followers who only follows 100 clearly thinks differently about Twitter reciprocity than I do! Also, it's plain old addictive. I'm on Twitter too much, and given that it's not yet a legitimate form of scholarly work, I do feel I need to be careful not to get too wrapped up to the detriment of the other work I do. Again, this is very much related to blogging (and really I see tweeting and blogging as different forms of the same 'public scholarly community' I'd like to be a part of). I can get a little obsessive about my follower count, worrying that if I tweet too much I might drive away followers, or even worse one of the followers I’ve enjoyed interacting with. So, it's an added stress in some ways. I was hoping it would be valuable for teaching, but so far it's been difficult to get very many students to see it that way. I've only used it that way for one semester, but already I'm thinking of pulling back on that front. TS: I'm very interested in the hierarchy point. I think about this a lot. Along what lines do you think hierarchies are formed? Have you made any observations about "Twitter stratification"? (I'm probably trying too hard to coin a phrase). But it’s interesting to observe the Twitter hierarchy among academics. Do you have more thoughts on this subject? Do you think ego is a key factor here? I try not overdo the self-deprecation thing, but I do feel like a second-tier (or third-tier) sociologist on Twitter. How about you? In terms of the whole hierarchy matter, I'll pose a basic sociological question: What's going on here? ML: Yes, I feel second tier, but I've had a chip on my shoulder my whole life, so it's hard to determine which comes first. It's interesting to think about whether the Twitter hierarchies are very different from other academic hierarchies. I'll have to think about that. Sort of related, I think you've got to be careful what you tweet about if you want to keep followers. 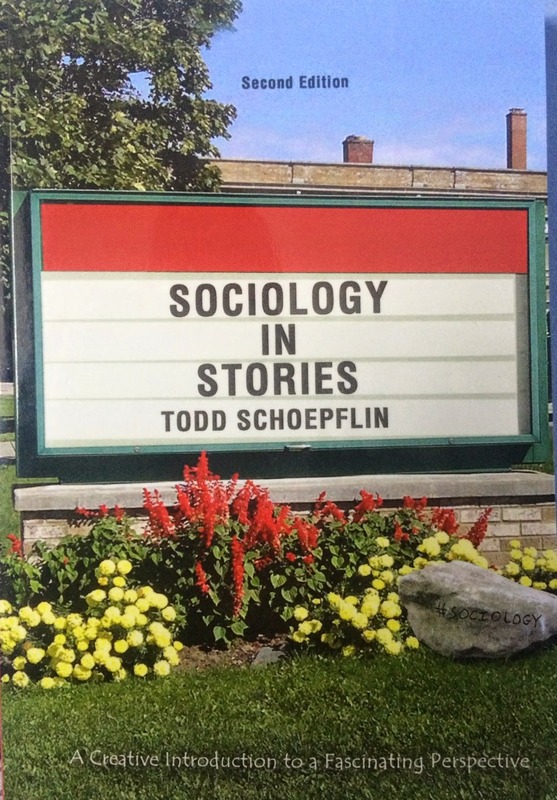 A lot of people, I think, aren't crazy about tweets about teaching, but that's a prejudice that infects the whole discipline (publications in "Teaching Sociology" don't count as much on the job market, that kind of thing). My favorite tweeters are those at '2nd rate' places who tweet about the full range of what this job is, and also occasionally leave hints that they are real people (music, tv, sports, etc.). Using Twitter as a 'professional' seems to limit what one can do. In this way it's so much narrower than 'real life' interaction with professionals that can sort of maintain its main 'professional flow' over and against little digressions into being people. Here I guess I'm thinking like Weber or Ritzer, but clearly Goffman too. Maybe Twitter is the McDonaldization of the process of self. All this said, my follower count has gone steadily up, and I feel like I'm only a moderately disciplined tweeter, and I've interacted with people who are at much 'better' schools than me, with much 'better' academic score sheets. TS: Interesting thought that "A lot of people, I think, aren't crazy about tweets about teaching." What leads you to say that? And can you expand your thought that "Maybe Twitter is the McDonaldization of the process of self." Please say more. When I say McDonaldization, I think what I mean to draw attention to is that followers are there for specific streams of content. I go to McDonalds if I want a hamburger, and I go to Taco Bell if I want a taco. Those are very rational/efficient ways to get food. If McDonald's gets too far afield from its core fare, then its consumers get confused, and probably displeased. You do burgers, McDonalds, not tacos! So, I think there is to some extent Weber's iron cage of rationalization because our behavior on Twitter is restricted by our followers (consumers) expectations. In copresent interaction, the audience constrains us too, of course, but the sanctioning is never as abrupt or as easily accomplished as the very simple, consumeristic Twitter 'unfollow.' No feed for you! Part of the unfollowing might just be that on Twitter, you are really just one feed among many, and if the feed gets boring or distracting, then you just cut it off. It's really not personal at all, and I've certainly unfollowed people myself. Here, maybe some C. Wright Mills could be useful. TS: I don't think you're too cynical. We're sociologists--we're trained to be cynical! My own taste is that I like people who tweet with variety. I like when people surprise me with their tweets. So as a consumer of tweets, I like when people mix it up. I will say when my own tweets go off course I think to myself "people aren't interested in this." But that's part of the beauty of Twitter...self-expression. One last question: does it seem to you that informal rules exist with regard to unfollowing? If so, do you find yourself adhering to particular norms? I actually prefer it when people’s tweets are sometimes riskier. All I mean by riskier here is less well formed thoughts. Some people really can get a lot of info in 140 characters, and I think that’s great. But, at the same time, I like watching people work things out in multiple tweets. Or even just sort of playing. I like that a lot, really. As far as rules, I try not to tweet too far afield, too often. I’ll let an occasional sports or music tweet in, but I’ve got another account that’s pretty much only that. I try not to tweet ‘too much,’ but I don’t really know what that means. I tweet probably, on average, 10 times a day. But, I don’t want to actually measure that because it might be a lot more! A note from Matt and Todd: We plan to interview scholars who use Twitter as soon as we secure IRB approval. We want to pick brains to find out what other scholars think about Twitter. Our interview here just scratches the surface of sociological inquiry. If you are interested in being interviewed by phone or e-mail, please let us know. Matt can be reached at @mtloveland or lovelam@lemoyne.edu and Todd can be reached at @CreateSociology or tas@niagara.edu. So please tweet/DM or e-mail one of us if you’d like one of us to interview you for your insights about Twitter.